Just because something is good, doesn’t mean that it will happen. In their new book, The Protectors, twin sisters, Avalene and Avalon are born into a family conflict that they must deal with while keeping their family’s faith. It is an empowering message about the struggle between good and evil in our day-to-day lives. “God uses those around us in how He interacts with us,” Owen’s said. The Protectors is an epic battle around a family’s curse between the good and evil in their world. “You do not need to be a Christian to enjoy reading The Protectors,” the Owen’s said. 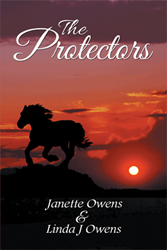 Author Janette and her daughter Linda Owens co-wrote this novel. Janette enjoys writing, sewing and embroidery and is very active in her community and church. Linda enjoys baking, musical theater and after earning an Associate’s Degree in Web Design helps maintain her church’s website.